VALENCIA, Calif.–(BUSINESS WIRE)–May 1, 2017– Millions of people worldwide are impacted by debilitating foot pain, making it difficult to accomplish such daily activities as climbing stairs or taking a walk. Enter 3D printing. Stratasys Direct Manufacturing is now collaborating with Peacocks Medical Group, a leading medical equipment supplier and creator of Podfo orthotics, to maximize 3D printing for large-scale production of custom orthotics. As one of the world’s largest 3D printing and advanced manufacturing service providers, Stratasys Direct is giving millions of new patients access to life-changing orthotics – offering much needed pain relief and improvements in mobility. 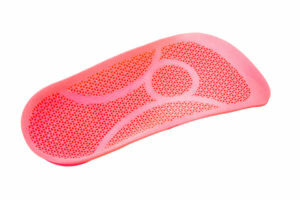 Foot orthotics is a large and growing market – with analysts estimating the insole segment reaching $3.5 billion by 2020. Conventional manufacturing processes require long lead times and are unable to cost-effectively produce advanced design elements – further creating barriers-to-adoption. Aided by an additive manufacturing technique known as Laser Sintering, the Podfo line fills this void with a comfortable, tough, lightweight and thin orthoses customized to each patient’s prescription and footwear. Advanced 3D printing technology enables creation of complex geometries and includes varying features within a single device – eliminating top-covers, glued-on pads or foams typically accompanying conventional methods. The advanced design freedom enabled by 3D printing ensures Podfo can achieve new levels of customization, creating accurately fitted foot orthotics with individually selected areas of control and flexibility. In Nylon 11, Podfo has a material perfectly suited to meet thin and lightweight functionality requirements. Material durability is tested to millions of cycles – ensuring designs retain optimum effectiveness over years of use.